Florida is a state in the southeastern United States, bordered to the west by the Gulf of Mexico, to the north by Alabama and Georgia and to the east by the Atlantic Ocean. Florida is the 22nd most extensive, the 4th most populous, and the 8th most densely populated of the 50 United States. The state capital is Tallahassee, its largest city is Jacksonville, and the South Florida metropolitan area is the largest metropolitan area in the southeastern U.S. Much of Florida is situated on a peninsula between the Gulf of Mexico, the Atlantic Ocean, and the Straits of Florida. Its geography is marked by a coastline, by the omnipresence of water and the threat of hurricanes. Florida has the longest coastline in the contiguous United States, encompassing approximately 1,350 miles (2,170 km), and is the only state to border both the Gulf of Mexico and the Atlantic Ocean. 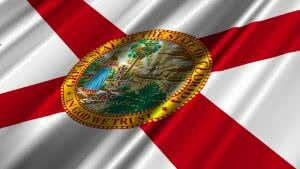 Florida is one of the most popular states for incorporation and LLC formation. Florida’s population and business community is constantly growing. Name of Florida corporation must be distinguishable from the name of any other existing entity. Company Express will research your company name to make sure it meets Florida’s standards. Turnaround time: About 2-3 business days. Apostille legalization or Certified copies will take about 5-7 business days. Director qualifications: Directors must be 18 years or older. Corporation’s principal office may be located outside of the state, but local registered agent is required in Florida. Please contact us if you need registered agent service for corporation in Florida. Annual report has to be filed before May 1st every year. The state fee is $150. Late fee of $400 will apply at the midnight on May 1st. Failure to file report will result in revocation on the 4th Friday in September. Name of Florida Limited Liability Company must be distinguishable from the name of any other organized entity or filing. Company Express will research your company name to make sure it meets Florida’s standards. Turnaround time: About 2-3 business days. Certified copies and Apostille legalization will take about 5-7 business days. Appearance in articles: Managers or Managing Members are required to be listed in the Articles. LLC’s principal office may be located outside of the state, but local registered agent is required. Please contact us if you need registered agent service for LLC in Florida. LLCs must file an annual report before May 1st every year. The state fee is $138.75. Only a manager or member may sign reports. Late feee of $400 will apply at the midnight on May 1st. Failure to file report will result in revocation on the 4th Friday in September.